Quick announcement: Questions have been coming up about the weather due to predictions for storms this week. The official policy is that Fun Run cancels if it is lightning out. The roads are open to the public, so it is your choice what to do, but it is officially over if we see lightning. A distant rumble of thunder may be overlooked. Steve Hill is implementing a similar policy for Wednesday evening workouts, but will let those on the list know exactly what his policy is. Races that people pay for are at the RD’s discretion. Right now, my hour by hour forecast for today says chance of rain, not thunderstorms at 5:30. Congrats to all who ran VCM. Looks like a couple of CVR club teams got 2nd and there were many notable individual and team performances. Lori Crotts’ 3:02 5th OA, 1st 25-29 was most impressive to me. Beautiful sunny day–so nice that many marathoners seemed to cramp due to not acclimating to such sunny warm weather. Maybe we’ll get a race results round-up with some witty insight soon. And I have to congratulate Lance on sticking with it to finish his 888K Infinitus race–the only competitor to finish which makes him the winner for sure. Kids Track Meet this Friday! 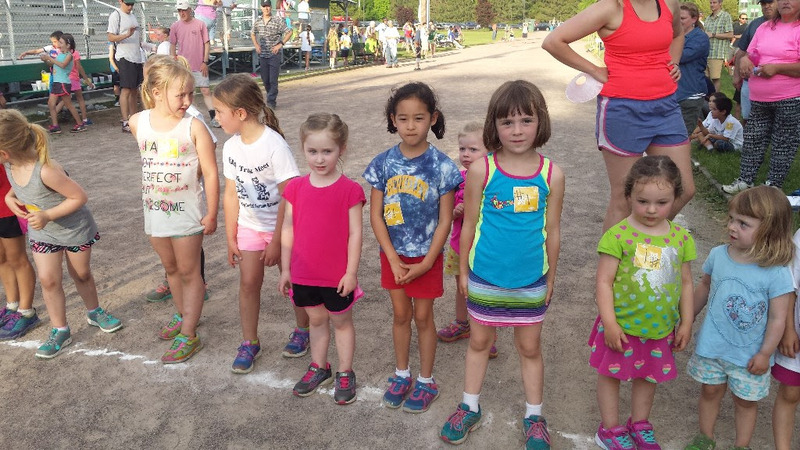 Dot and Sandy still need a few volunteers for the Kid’s Track Meet this Friday June 2–registration at 5:30, event starts at 6 pm. Bring your kids to race if you have any and let your neighbors with kids know about it. Please contact Dot dothelling@gmail.com to volunteer. Please note that last week I had the correct date here, but incorrect in the calendar at the bottom. Thanks to an observant Newton Baker for pointing that out to me. I stand corrected. Come enjoy the fun this Friday evening! Capital City Stampede is coming right up a week later, Saturday, June 10, and Shannon definitely needs volunteers. Construction at State and Bailey means a few extra people helping out. Contact Shannon shannonsalembier@gmail.com to let her know you can help. Of course I always tell people to do the race and get your CVR/ORS series points if you can; there is the option of helping with registration or set up and then racing too. Paul Mailman 10 Miler and 5K is just 2 weeks later on Sunday June 25. Register soon for both Capital City and Paul Mailman and save $5 each over race day registration. That would cover your Bear Swamp and Berlin Pond Entries! Let Andy Shuford, andy.cvr@myfairpoint.net know if you can volunteer for Paul Mailman. Registration for the July 3 Montpelier Mile is up! This is the quickest CVR/ORS race series points you can earn and one of the best spectated races in Montpelier. Register early and save. And I recommend a few Wed night speed workouts in the next month to get ready. Since it will be chip timed for the first time, CVR will not need to supply nearly as many stressed out volunteers. A few more CVR volunteers are still needed to help out, so let me know if you can be there in a non-racing mode. On the heels of the Montpelier Mile, the Stowe 8 Miler and Flying Onion 5K, July 9, is another CVR/ORS series race. Unlike last year, there is not a club participation competition, but you can get series points in either the 8 Miler or the 5K. Ask Chris Andresen for advice about weighing the competition in each race to maximize points. He seems to be good at that. Final Reminder: This is your last News & Notes if you are still a 2016 member.